For the last few decades, dual language immersion programs in Indiana’s schools have been rare. A handful are sprinkled throughout the state, but after this year’s legislature allocated $500,000 to start a dual language immersion pilot program, five more schools will join the pool of available programs. This type of language initiative provides a unique learning opportunity for students and has been shown to increase test scores. Still, while many educators agree this type of program is academically and culturally beneficial for students, a lot needs to go into it for it to be successful. A group of first graders are listening intently as Pilar Sanchez goes through the list of steps for planting a lima bean at the front of the classroom. It’s a typical lesson for an elementary school science class, except here at Theodore Potter, a K-6 school within Indianapolis Public Schools, the lessons sound very different from other schools. “Es una semilla,” Sanchez says as she holds up a lima bean. “I only use Spanish mainly to teach the class because this is a Spanish immersion school so the whole point of it is that the kids learn the Spanish through the subjects,” Sanchez explains after the class ends. This is how dual-language immersion programs work. During half of the subjects taught, the teacher only speaks to students in the target language. The same classes are taught in the same language every day – Language Arts is always in English, math is always in Spanish. 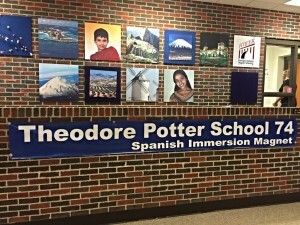 Theodore Potter also adds another layer to the language immersion – half of the students at the school are native Spanish speakers, and the other half are native English speakers. So in each class, no matter what language it’s taught in, half of the students are learning in their native language. Research shows this strategy is working. At Theodore Potter, almost 90 percent of kids are passing the ISTEP+, compared to the rest of the district which has a 50 percent passage rate. Nearly all of the school’s Spanish-speaking teachers come from Spain through a visiting teacher program run through the U.S. State Department, because as principal Tim Clevenger explains, foreign teachers are crucial for the native Spanish speaking students. But foreign teachers bring a huge hurdle in the form of red tape. Because of changes through the State Department this year, two of Clevenger’s new hires from Spain are still waiting for their visas to go through. “So right now in kindergarten and third grade we have substitute teachers in there and we’re supplementing the Spanish curriculum best we can,” he says. Until now, there hasn’t been much need for teachers who can work in this type of environment –Theodore Potter is one of only six existing dual-language immersion programs in the state. But five more programs will soon be added to that list: the legislature approved a new dual language immersion pilot this spring, awarding half a million dollars to five schools to start new programs. It’s something Catarina Blitzer has been advocating for for years. Blitzer was part of the team within the Department of Education that selected which schools received grants and says the state funding dual language immersion programs is overdue. “Programs like this in the public education sector are a very important economic development signal that leaders in Indiana understand we have to be ready for the world and we welcome not only their plants and their investment but also their children into our public school system,” Blitzer says. Blitzer says 15 schools applied for the grant, and even though only five were chosen, she says this is a good sign that educators are also ready to embrace this type of learning. Poston Road Elementary School in Martinsville is one of the schools that received a grant and will launch one dual-language immersion kindergarten class in January. Superintendent Michelle Moore says her main focus now that the district has money is making a hire. “We’re looking for someone that if they’re not a native speaker, ideally, has taught in an immersion school or in an English Language Learner program where they’ve taught in a bilingual environment before,” Moore says. Unlike Theodore Potter, which only employs native Spanish speakers, a native English speaker fluent in Spanish will work for the program in Martinsville, because very few of the students in the program will be native Spanish speakers. Most of the new programs will start in kindergarten and hope to build from there. The initial grants last two years and after that the new programs are eligible to reapply for funding to expand their programs once the initial grant money runs out.